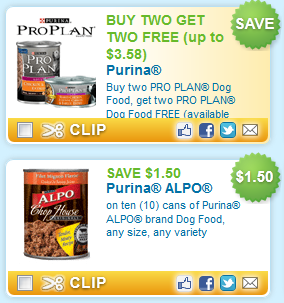 Does your dog or cat love Purina Pro Plan? Let's save some money with this Buy Two Get Two Free at your local Petsmart! You can usually print each coupon twice per computer! If you have family and/or friends willing to print coupons for you, you could save even more! Your freebies not arriving? We really hate to blame the mail carrier, but a couple of readers who weren't receiving any freebies, put a "Hold Request" on their mail for 2 weeks and chose "Pick-up", rather than having it delivered. When they went to pick up their mail, they got 2 plastic bags full of samples!